Pick an isotope and a date and this spreadsheet will do the rest.. Spreadsheet to calculate doserates near Cs137 tube sources based on away-and-along doserate lookup tables. To independently check your TPS calculation with Isotope Products Laboratories (IPL) Cs-137 sources. Reference used and instructions for use are available upon request. Warning: The absolute dose rate table for IPL source is different from 3M source. Word file with instructions for dosimetrists to perform very basic T+O drawing and digitize points and sources into Pinnacle 7.4. Ir-192 decay table showing activity for 123 days past the calibration date. 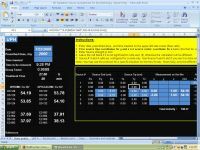 An automated excel spreadsheet hand calculation for MammoSite. 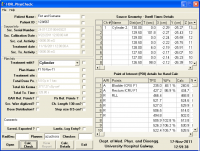 This excel spreadsheet will handle a typical Iridium HDR brachytherapy source calibration.